When Victor Martinez went down with a torn ACL, it became fairly obvious that the Detroit Tigers were going to make a move to find a designated hitter / first baseman to plug into the order. No one could have imagined what general manager Dave Dombrowski had in mind. On Tuesday, Detroit shocked the baseball world by signing former Milwaukee Brewers first baseman Prince Fielder to a nine-year, $214 million contract. With Miguel Cabrera and now Fielder in the middle of the lineup, the Tigers look ready for a season of slugging at Comerica Park. Detroit won their division last year by 15 games before losing in the American League Championship Series to the Texas Rangers. With Fielder added to the mix, manager Jim Leyland has a team that figures to enter the 2012 season as a favorite to repeat in the division, with an eye on winning the franchise's first World Series title since 1984. 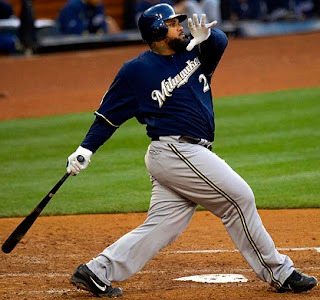 Fielder hit .299 with 38 home runs and 120 RBIs in 2011. He is a three-time All-Star and was the MVP of last year's event in Phoenix. The slugger has averaged 40 homers and 113 RBIs over the past five years. He's also been among the most durable players in the majors, appearing in at least 157 games in each of the last six seasons.